Since Assassin's Creed: Unity won't be making an appearance on last-gen systems, it wont be making any compromises with what the developers can do in the game. It's a game built entirely around new hardware. And damn if it doesn't show, based on the footage that Ubisoft debuted today during E3. The scene opens with an assassin staring down at a crowd of people—and our reaction at Kotaku HQ was definitely "wow, that is a lot of people." The rest of the demo goes on to show the franchise's standard sneaking and scaling, but where it really shines is in the level of detail. This world actually feels populated, and that's rare for a video game. The amount of people almost seems overwhelming at times. It's impressive. We'd seen the game's locale, France, before--but not like this. 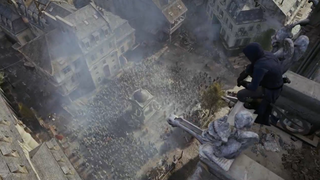 Assassin's Creed: Unity will feature 4 player co-op, which we saw in action earlier during Microsoft's E3 presentation.